Welcome back to our series on art history! From the wondrous Renaissance period, we now venture onward to experience the world of art from indigenous North America. Let’s see how history significantly affected the art of this time. Long before cement roads or skyscrapers filling the sky with twinkling buildings, there were always indigenous people combing the lands of North America. Tribes of nomadic hunters and semi-nomadic farmers settled in its vast regions, cultivating the crops there while learning the many wonders of their land. And with limited resources, they communicated a profound love of nature and spirituality through art. From exceptional basketry to glorious stone carvings, indigenous North Americans mastered the art of many handmade crafts. We can learn a lot from the patience, hard work, and resilience of these people. So let’s honor their work with a look at their various creative crafts. It all begins, of course, with cave “paintings.” Also known as a petroglyph, these pictures were actually carved into massive rock walls all around North America and depict various animals and symbols. It’s hard to assume the meaning behind this work, though researchers often conclude that they were used as geographical markers, maps, and religious imagery. 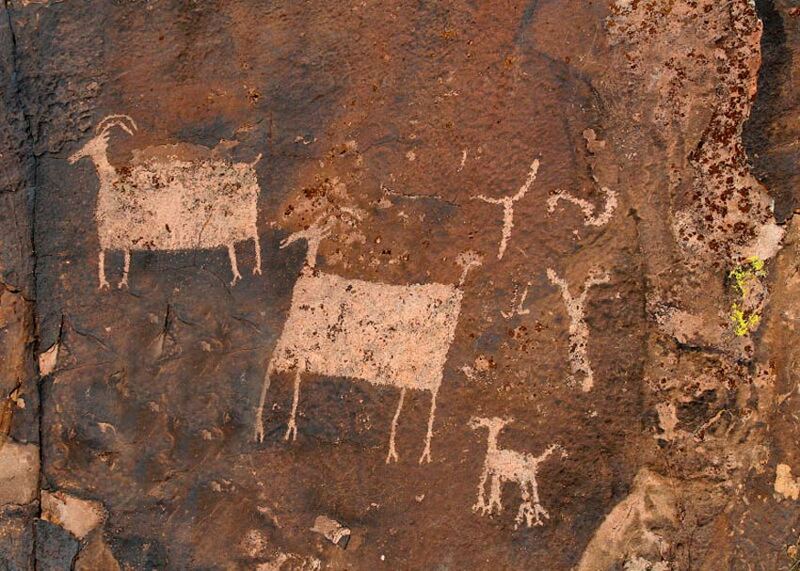 The Rochester Rock Art Panel, for instance, is a series of petroglyphs three miles east of Emery, Utah, believed to be the work of the Fremont people. 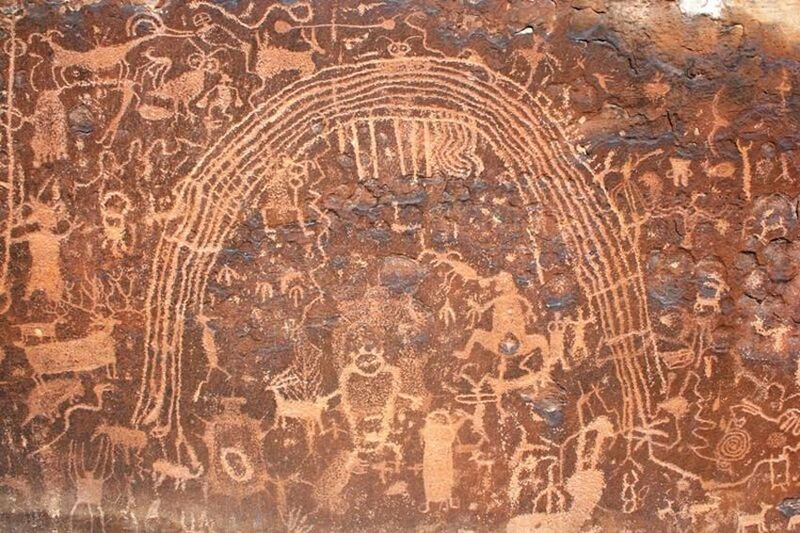 Consisting of several large rock art pieces, the work contains everything from snakes and rainbows to mysterious human-like figures. So what could they mean, and how did the people of their day communicate with them? Perhaps we’ll never know, but it certainly adds to the lure of indigenous art culture. Speaking of incredible stonework, we can’t forget to mention the gorgeous sculptures created by indigenous North Americans. 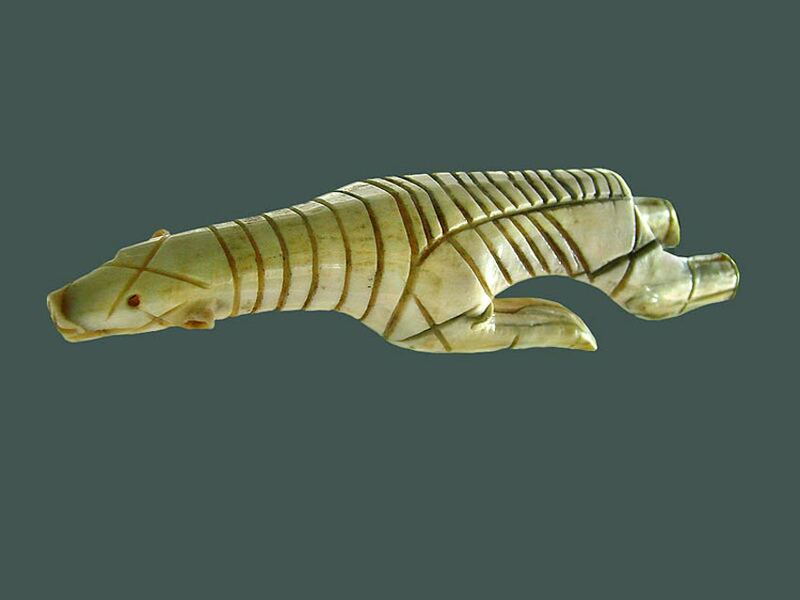 Sperm whale ivory served as a prominent medium for the Paleo-Eskimo people of the North American Arctic, where they often carved animals like polar bears out of this valuable medium. 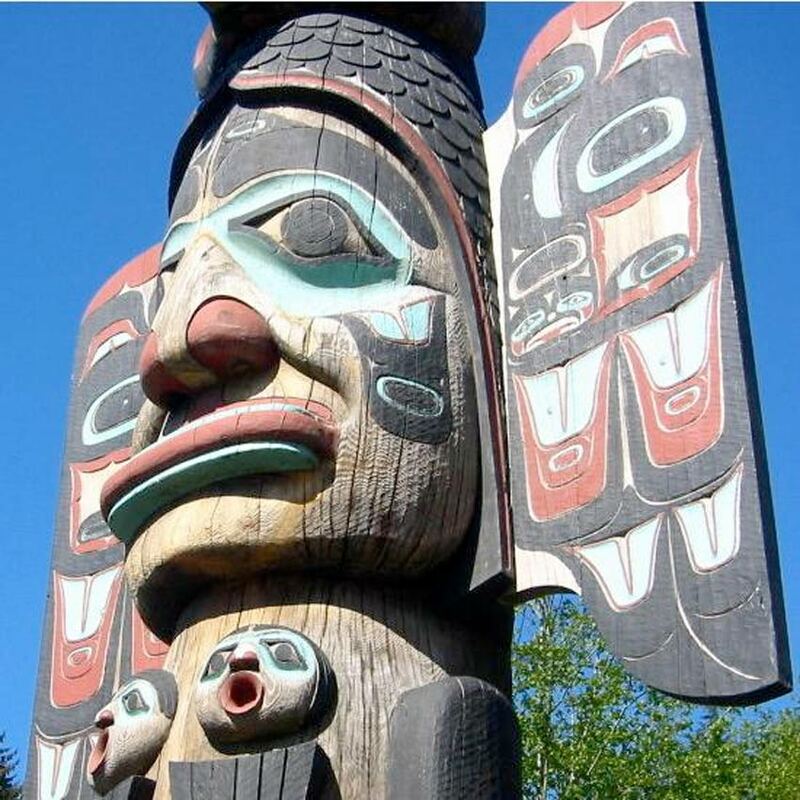 While tribes living in the Northwest favored complex woodcarvings to create stylistic totem poles, canoes, and transformation masks. 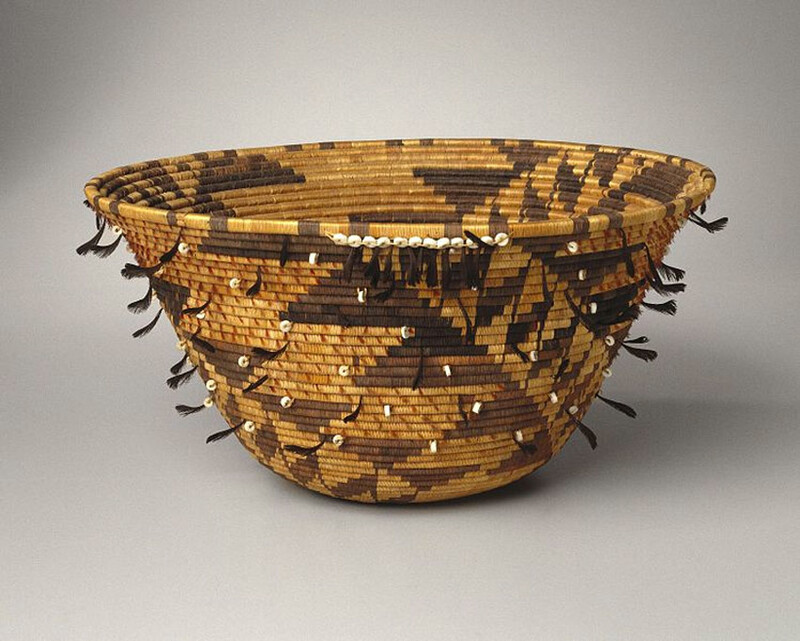 Working primarily with the resources that surrounded them, pre-colonial North Americans continued their handmade crafts with exceptional basketry and woven pieces. Basket weaving always served a dual purpose: as a beautiful work of art that was also highly functional. It was especially popular among Native Americans in California. 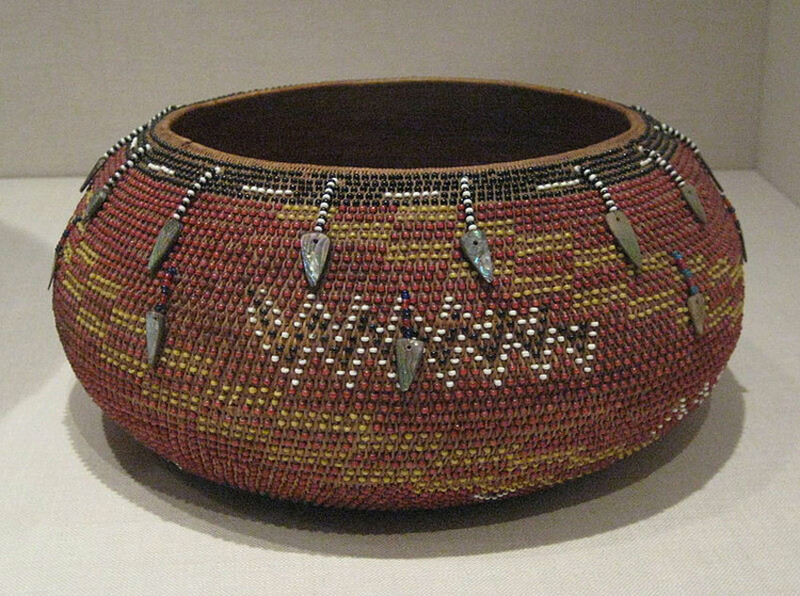 Tribes like the Pomo people passed down the tradition of basket weaving with plaiting, coiling, and twining techniques. 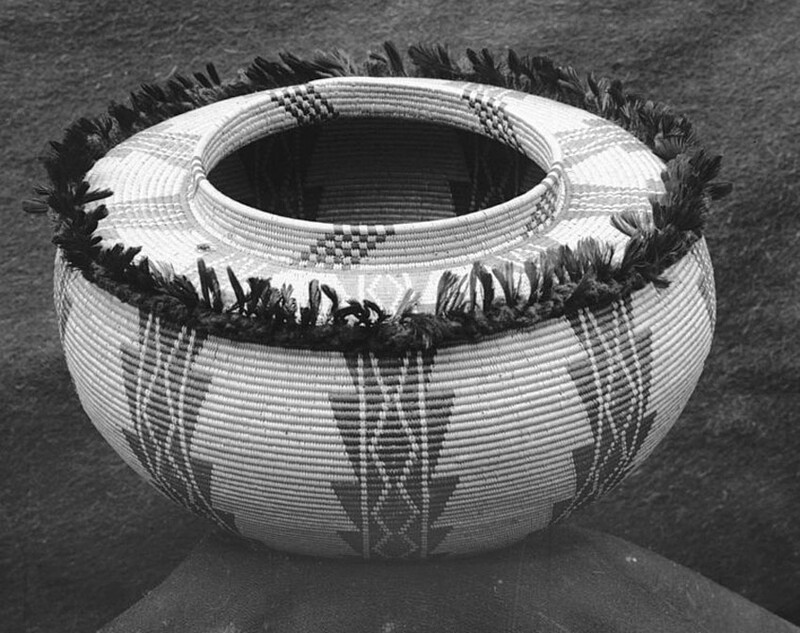 Because of their great finesse with their craft, Pomo baskets were sought out worldwide. Techniques changed according to the materials used, which were usually picked and washed by hand, before being soaked, dyed, and finally woven. Also known for their basket weaving skills were the indigenous people of the Great Basin. Weavers wove stunning baskets for their everyday use and even incorporated seed beads onto the surface of baskets to waterproof them. We are probably most familiar with indigenous art for the amazing masks and clothing that belonged to these people. 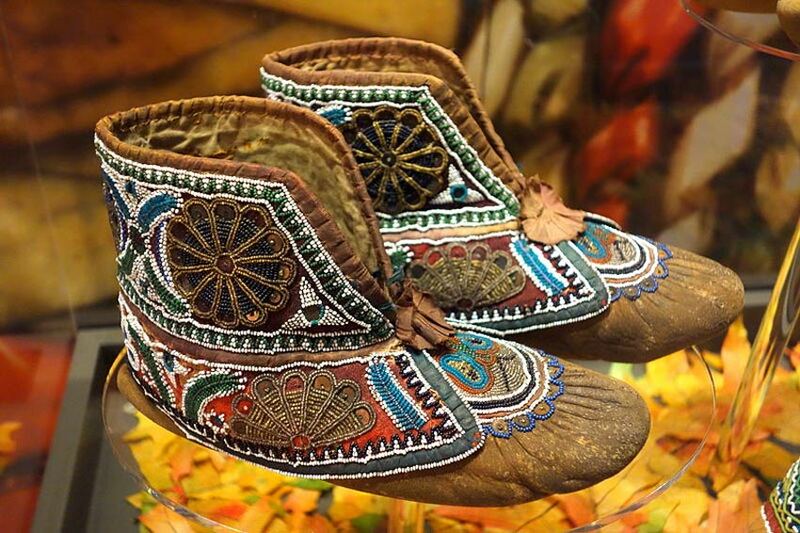 The casual yet popular moccasin shoe, for instance, originates from the hard-soled shoes worn by the Plains Indians. The Nez Perce tribe of the Pacific Northwest were known for their gorgeous beaded clothing and hemp dogbane bags decorated with geometric designs. A common style among Native Americans, these geometric designs even inspire the work of 21st century artists today. 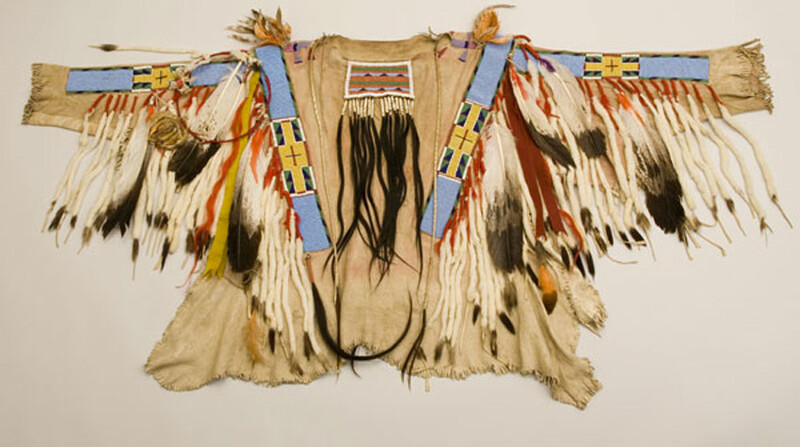 Quillwork was also a popular technique for textile embellishments used by many tribes to decorate buffalo hide clothing. Porcupine quillwork is especially unique to North America, where it became a huge decorative element for those who resided in the porcupine’s natural habitat. This style can be seen in stunning knife sheaths, moccasins, and elaborate shirts. 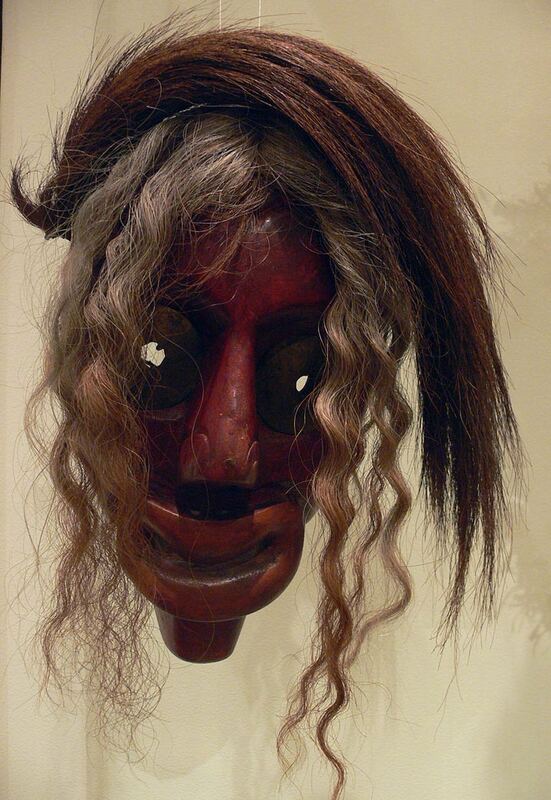 Though they aren’t clothing per se, masks were also a huge part of indigenous art culture and were often used in traditional ceremonies and dances. People carved beautiful masks out of wood and other materials to adorn themselves. The Iroquois created masks for the False Face Society, a group known for their medicinal and healing rituals used to invoke the spirit of an old hunch-backed man. Carved directly into a tree, the masks are then removed and painted with red and black colors. Though a bit jarring in style, these exceptional masks were used twice a year to restrengthen the power of the spirit they celebrated. And they remain today as an incredible testament to the spirituality of indigenous North Americans. The art from Indigenous North America reflected the heart and resilience of its people. Its wide range of culture and influence is a true testament to the evolution of art, and I hope you continue to learn more about these amazing timelines on your own. For more amazing tales of art history from indigenous North America, dive into the links below for further reading. And join me next month when we discuss art from indigenous South America.